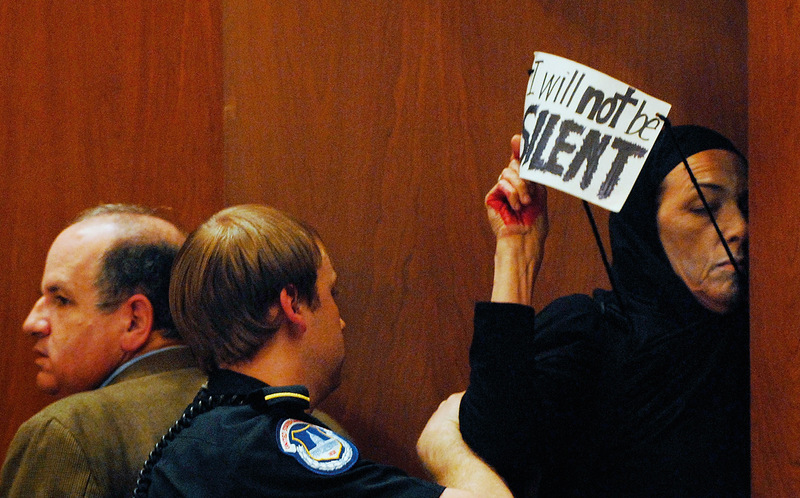 Speaking truth to power: a protester makes her point before being bundled out of a US Senate hearing on the Iraq war. When Saddam Hussein’s forces occupied Kuwait in August 1990, the US led a massive coalition to oust them. Having assembled 600,000 troops and 1,000 planes from more than 30 countries, Operation Desert Storm started in January 1991 with a huge air assault that was confidently expected to force out the Iraqis. Within 24 hours, however, things had begun to look very different. Iraqi Scud missiles started hitting Israel, leading to a sustained diversion of effort as the Americans and their coalition allies tried to defuse this new threat. To make matters worse, the Iraqis also aimed Scuds at Saudi Arabia, one of them hitting a Marines depot killing 28 people, the worst US loss of life in the war. Eight years later, it was revealed that another Scud strike had very nearly been catastrophic, and might have affected the outcome of the entire war. It landed in the sea 300 yards from a US Navy aviation support ship and near the amphibious warfare ship USS Tarawa. Both were moored alongside a pier complex at the Saudi port of Jubayl, which included a large ammunition storage dump and a parking lot for petrol tankers. If the Scud had hit its target instead of landing harmlessly in the sea, it could have set off a huge chain of explosions and fires, killing thousands. The 1991 Iraq War was widely seen as a great victory for the West, but behind the scenes in military circles some serious lessons were being learnt. What was expected to be a new world order, in which the ending of the Cold War and demise of the Soviet bloc would lead on to international stability rooted in Western economic and military power, now looked much less certain. One far-sighted American writer, a former submarine commander called Roger W Barnett, succinctly highlighted the impact of ‘high technology weapons and weapons of mass destruction on the ability – and thus the willingness – of the weak to take up arms against the strong’. A most uncomfortable lesson of the 1991 war was that a middle-ranking state such as Iraq (previously a close ally of Washington) could use crude 1960s missile technology to probe weak points in the armed forces of the world’s most powerful country. As a result, during the 1990s, missile defence got a new lease of life. Billions of dollars were poured into ‘theatre missile defence systems’, designed to protect US forces and their allies when they are engaged in military operations in regions such as the Middle East. But the missile ‘threat’ was just one part of a much wider predicament that has brought nuclear weapons right back into the frame for the West. The core problem is that maintaining a world peace centred on Western interests must involve a willingness to use force when those interests are threatened, whether that be in the Middle East, South West Asia or elsewhere. The US may now spend more on its military than every other country in the world combined, and its forces may be pre-eminent in their capabilities, but that does not prevent their use being constrained by crude but powerful deterrents fielded by otherwise weaker states. Iraq’s Scud missiles were early examples of this, but a much more worrying combination, from the Pentagon’s perspective, is the development of small nuclear arsenals by potentially hostile states such as Iran and North Korea. The Pentagon gets even more concerned when these uncontrolled weapons are combined with delivery systems such as ballistic missiles. The Scuds that hit Dhahran and narrowly missed Jubayl were armed with conventional warheads, but even crude nuclear devices would be far more potent deterrents against Western military interventions. One response is to call for a nuclear free world in which, cynics might say, conventional military power would rule supreme again; but most strategists don’t buy this. They call instead for robust nuclear forces to be retained indefinitely. This does not mean that arsenals will be kept at anything like the stupefying Cold War levels, but it does mean that nuclear weapons will be with us far into the future. Britain is a good example of this thinking. It plans to replace its current Trident system of nuclear missiles in a couple of decades with new weapons designed to see the country through to the second half of the 21st century. Alongside them, the UK is planning to build two giant new aircraft carriers, the largest warships ever built for the Royal Navy. These will give Britain a warfare capability that will be second only to the United States, enabling it to continue to fight alongside its ally in what it sees as crucial regions such as the immensely oil-rich Persian Gulf. But what is the use of such warships if regional opponents have their own nuclear arsenals, however small? A 65,000-tonne aircraft carrier and its surrounding flotilla could be destroyed by a single nuclear weapon, so there has to be a back-up. This is where nuclear forces come in useful. Britain, like the US, France and Russia, has been very careful not to rule out using nuclear weapons to attack first rather than limit their use to self-defence. It has also developed small nuclear warheads whose destructive power falls far short of the feared global cataclysms of the Cold War. Last year’s White Paper on the Trident replacement did its best to avoid admitting to such thinking, but also had to avoid lying. It therefore limited discussion of such considerations to a couple of short phrases in an otherwise lengthy and detailed document – but these two phrases allowed Britain to maintain the option of first-use of a nuclear weapon as well as the need to have small nuclear weapons, without engaging in an embarrassing public debate as to why. Moreover, to avoid all talk of nuclear war-fighting, the term ‘tactical’ nuclear weapon was abandoned a decade ago, to be replaced by the more anodyne ‘sub-strategic’, but even that has now been banned from the nuclear lexicon. In polite circles it is simply not the done thing to talk about actually using nuclear weapons. These new nuclear realities make it much more difficult for activists to campaign against a world in which nuclear weapons still play a central role. During the Cold War there was a small risk of an all-out nuclear war that would have devastated the Northern hemisphere and much of the rest of the world. We were peering into a nuclear abyss and although the risks might have been relatively small, the consequences would have been utterly disastrous. Now it is more like a slippery slope – a slow descent in which the lead nuclear states refuse to countenance any end to their nuclear dominance. The risk is that some time in the next couple of decades, a regional crisis will ‘go nuclear’, with two possible outcomes. One is that it might escalate to a global nuclear war. Even if we are down to a few thousand warheads instead of the tens of thousands of the Cold War era, just a fraction of them would cause utter devastation across much of the world. The other outcome is that a nuclear war stays within a particular region, killing hundreds of thousands or even millions of people but not escalating to a global catastrophe. Apart from the dreadful immediate consequences, that could mean that we become accustomed to using nuclear weapons as instruments of warfare. The taboo that has held since Nagasaki will have been broken, leading to a formidably more insecure world. For the Western military establishment, nuclear weapons must remain at the centre of their overall approach to security. From their perspective, the coming decades will be fraught with unplanned and uncontrolled developments in which terrorism, extremism, rogue states, mass migration and many other threats all have to be contained. With the ending of the Cold War we had ‘slain the dragon’ – but in the words of one former CIA Director, James Woolsey, we now live in ‘a jungle full of poisonous snakes’. That jungle has to be tamed and controlled. That means we must have the back-stop of nuclear forces for the indefinite future. The alternative is to recognize that such an outlook is self-defeating. It is best described as ‘liddism’ – keeping the lid on things rather than acknowledging the underlying problems. The main security issues for most of the world’s people are matters such as the widening socio-economic divide, climate change and resource scarcity. If the world’s élites try to close the castle gates and preserve their lifestyles, they will simply end up with an embittered environment in which everyone becomes less secure. The very fact that nuclear weapons retain their salience is evidence of an utter lack of new thinking by our political leaders. We are still stuck with Cold War attitudes that are at least two decades out of date. But changing this mindset and moving towards an outlook that addresses the real security threats facing the world will require not just the efforts of dedicated anti-nuclear campaigners but the combined work of development and environment activists, North and South. Paul Rogers is Professor of Peace Studies at Bradford University. His latest book Why We’re Losing the War on Terror (Polity) was reviewed in NI 409.